1) Can I hire a performer to do only face painting or only balloon twisting? Yes! 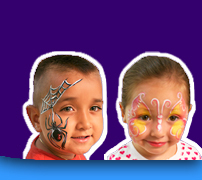 Our specialty is face painting and balloon twisting, and either one can be a wonderful addition to your party. Or try both at once! Nothing goes much more smoothly than having a face painter and a balloonist to keep your kids entertained. 2) I have great games I like to have the kids play. Is it ok if we incorporate them with the performer? It is nice when the parents participate and help the kids have fun with the performer. We try to avoid games that eliminate children from participating, such as Hot Potato and Simon Says. We also avoid games in which children could get hurt such as Musical Chairs. If you want us to play a game we think is unsafe, we will hand the game over to you and after the game is finished we can resume control of the entertainment. 3) Can adults get their faces painted and request a balloon twisting from the performer? We love to do face painting and balloon twisting requests for adults too; however, because children tend to be impatient we try to take care of the children first. After all of the children have gotten balloons and/or their faces painted, as time allows we will begin with the rest of your guests. 4) I have hired performer from a different company and they were very late and sometimes the performers never even showed up. We do everything we can to ensure that our performers arrive at the time agreed. Unfortunately there are things beyond our control such a flat tires, detours, and traffic. We do our best to anticipate and allow for such things, but if the performer is delayed past the agreed time, you will be notified immediately. 5) How will I know if the performer or performers I want are booked? We strongly suggest booking the performer or performers at least 2 to 3 weeks in advance. Our performers can book up quickly, so to ensure that your preferred performer will be available, please call us as soon as you know the date and time of your party and the performer you want. However, sometimes we will have the performer available the week of your party. We work on a first come first serve basis, so please don’t wait until the last minute to call! 6) Can I leave my kids with the entertainer while I attend to my other guests? We understand the host or hostess must sometimes take care of other things while the children are being entertained. We suggest having an adult present at all times. Our intent is not to baby-sit but to entertain the kids. If a child is getting a little too excited and is disrupting the others, we would greatly appreciate a parent stepping in to keep the child under control. 7) Are your balloons safe for children? We have never had any problems with the safety of balloons. We love children and love seeing the expression of joy on their faces when they get a balloon animal, and we want to share this information with those who may not be aware of balloon safety.